All the essential China sightseeing in a neat Dragon Holidays package that begins in Beijing with Tiananmen Square, the Forbidden City, the Great Wall, Temple of Heaven and Summer Palace...where the controversial Dowager Empress Cixi spent the last 30 years of her fascinating life. (Do read up about her even before you go!). You travel on to Xi'an (pronounced shee-an) to experience the archeological find of the 21st century...an underground spirit army made from clay, and which has now become as important a tourist attraction as the Great Wall. You fly on to sensational Shanghai, still glinting from its World Expo makeover, and offering very exciting experiences...like a ride on a 431km/h train. Shanghai is Old and New...it is East-Meets-West...it is gardens and shrines and shopping and non-stop excitement. Our detailed itinerary reveals all about this best-seller...for clients with budget or time restraints. For the prices below, we have separated the Land arrangements and international airfare. However, please note that the price for the Land arrangements do include all domestic flights within China. After breakfast, have some free time in the morning before saying goodbye to your Beijing guide as you will be transferred to the train station. Enjoy the scenery en-route on your High Speed train journey from Beijing to the ancient city of Xi'an. Upon arrival, your local Xi'an guide will meet you at the train station and take you to visit the Ancient City walls that surrounds this old city. If you are interested, you could even rent a bike on the wall and ride the entire wall in an hour and a half. visit the Big Goose Pagoda where you will be able to climb to the top of the pagoda for a bird's view of Xi'an. In the evening, enjoy a Dumpling banquet before returning to your hotel. After breakfast, hop over to Shu Yuan Men for some unique shopping experience. It is time to say goodbye to your Xian guide as you will be transferred to the airport for your flight to Shanghai. Domestic Flight (included) from Xi'an to Shanghai. 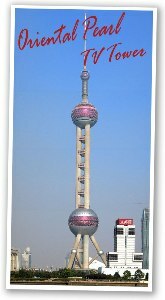 Upon arrival, your local Shanghai guide will meet you at the airport and take you to visit the Oriental Pearl TV tower, for a bird's-eye view of this modern city. Then on to Shanghai's landmark - the historic Bund. Later time for shopping in famous Nanjing Road. After dinner, have a cruise on the Huangpu River for the night view of Shanghai before transferring to your hotel. Due to the current fluctuation of the Rand against the US Dollar, we have quoted in US dollars for the land portion of this tour only. For the International flights, please book online or check with your local travel agent. B. Domestic airfare and taxes between Xi'an & Shanghai. C. Hotels (twin share basis) as listed in the itinerary. D. All Entrance fees as listed in the itinerary. E. Scheduled sightseeing by air-conditioned coach with a shared English Guide in each city.